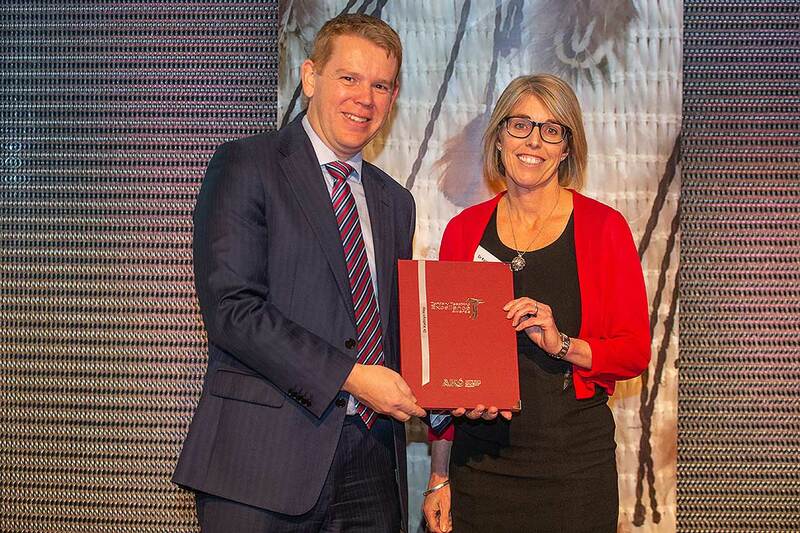 Minister of Tertiary Education Chris Hipkins and Dr Kathryn Hay, who was last night awarded a Sustained Excellence in Tertiary Teaching Award, from Ako Aotearoa. Photo credit: Ako Aotearoa. Dr Kathryn Hay and Professor Andy Martin were last night awarded Sustained Excellence in Tertiary Teaching Awards for 2018 as part of the National Tertiary Teaching Awards. The awards, run by Ako Aotearoa National Centre for Tertiary Teaching Excellence, were presented at an evening parliamentary ceremony hosted by the Minister of Tertiary Education Chris Hipkins. Awards are presented to those who demonstrate years of commitment and support for learners that go far beyond good teaching practice. Dr Hay and Professor Martin, from the School of Sport, Exercise and Nutrition, are among the country’s top 10 tertiary teachers awarded last night and received $20,000 and a certificate. See what Dr Kathryn Hay and her students have to say about her approach to teaching. Video credit: Ako Aotearoa. As a senior lecturer in the School of Social Work, Dr Hay’s innovative practice breaks down the boundaries between theory and practice to help students navigate the challenges inherent in job placements. "I am excited by the way the experiential learning process involves students directly in the learning process and facilitates their critical reflection on their experiences so that they gain a better understanding of their new knowledge," she says. Dr Hay’s commitment to social justice has driven her work in social work field education for the past 15 years. This commitment is evident in her teaching approach, which focuses on participation, inclusion, and empowerment. One student said, “you are very attentive and inclusive, which made it easy to engage and share”. Her innovative practice breaks down the boundaries between theory and practice to help students navigate the challenges inherent in job placements. Check out what makes Professor Andy Martin's teaching style, so unique. Video credit: Ako Aotearoa. Professor Martin is an inspirational teacher who maintains a critical balance between the demands of his subject and the dynamic challenges of exceptional teaching practice. “I don’t describe myself as just a teacher instructing specific skills or curriculum content, but rather as an educator coaching individuals,” he says. His teaching is a unique blend of enthusiasm, student-centred learning and subject passion, and it is evidence and research-based. Professor Martin really inspires sport management students, who had these comments to say about him: “You’ve been the lecturer (by a long mile) with the greatest passion and desire to be the best they can be”, “I know you want the best for me and I wouldn’t have got through without your help” and “You are the one who fuelled my passion to carry on”. His excellent teaching has received several awards including the Massey University Vice-Chancellor’s Award for Sustained Teaching Excellence and the Academic Fellowship Award. For more information about the awards visit the Ako Aotearoa website.